In an enchanted mountain, among sounds, colours, magic and some reality, you can experience, with us and our horses, the emotion of an unforgettable ride through chestnut and beech woods along fascinating paths full of surprises. Ivan Lazzeroni is an independent farmer. He has been running the “Centro Equestre Ambasciador” (Equestrian Centre) for over fifteen years. He developed his passion for horses at the very beginning of his activity by managing a horse-breeding farm, and now he likes sharing this passion with other people. Moreover Ivan did his military service with the “Cavalleria Savoia” (Savoy Riding Academy) where he specialized in obstacle jumping and acquired his first notions as a farrier, Later on, he took these notions to heart carrying on this activity at the “Centro Equestre”, shoeing his own horses and preparing them for the rides. In his professional career he received the qualification of “Equestrian Environmental Guide” and “Federal Equestrian Instructor” (F.I.S.E.) 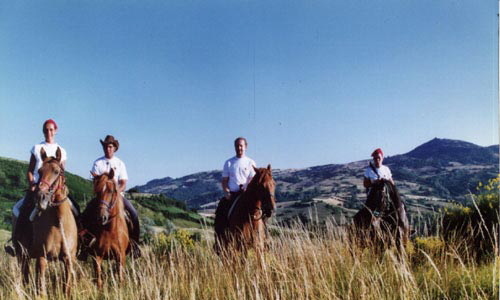 – First Level of “Cross Country Riding”. Ivan still breeds and trains horses. During the winter he works as a ski instructor. Giulia Pomoni has been collaborating with Ivan for many years. Her love for horses was born before starting her profession. Her passion and her experience have helped her to become very professional and to develop a deep knowledge of the equestrian world. Since she has been teaching children for many years, she can work with them particularly well. Seeing her helping children in their approach to horses, one could say she is exactly the right person at the right place. Besides she has been working with groups and associations of national importance such as ENI and BOOGAN, taking part in several holiday camps. In winter Giulia works as a teacher in nursery and primary schools. She also helps Ivan in training colts and leads riding groups. the National Corporation Environmental Equestrian Guide (E.N.G.E.A. ).